Gifting times are here again. This season, why not try something new on Festivals, Birthdays, and Marriage anniversaries? Gift your Loved One with such a beneficial present that will bless them with Good Health. Forget the Ornaments, Clothes, Watches and Boring gift certificates. Thrill your parents, friends and relatives with this unique and fun gift of HEALTH. 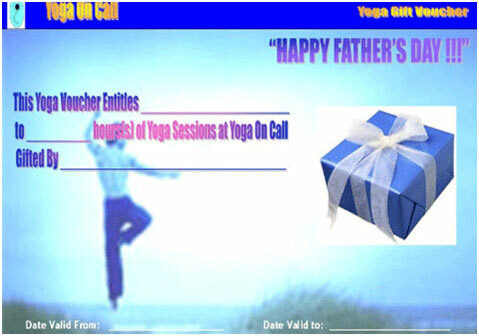 Pre-purchase specially discounted Yoga Sessions Vouchers as a Unique Healthy Gift not only just to say "I Love You" but also "I CARE for you". * Give your Spouse/Parents/Children/Friends the Gift of Good Health for their Birthday or any other special occasion. * Give your Dad the Gift of Good Health for Father's Day this Year. * Give your Mom the Gift of Good Health for Mother’s Day this Year. * Give your Daughter the Gift of Good Health for Daughter’s Day this Year. * Give your Son the Gift of Good Health for Son’s Day this Year. * Give your Spouse/ Parents/ Children/ Friends the Gift of Good Health for their Birthday this Year.